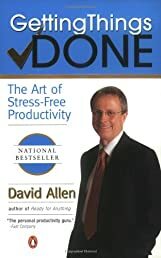 With first-chapter allusions to martial arts, "flow," "mind like water," and other concepts borrowed from the East (and usually mangled), you'd almost think this self-helper from David Allen should have been called Zen and the Art of Schedule Maintenance. As whole-life-organizing systems go, Allen's is pretty good, even fun and therapeutic. It starts with the exhortation to take every unaccounted-for scrap of paper in your workstation that you can't junk, The next step is to write down every unaccounted-for gotta-do cramming your head onto its own scrap of paper. Finally, throw the whole stew into a giant "in-basket"